Not only is Newt seemingly incapable of inventing short and catchy slogans, his grasp of the facts is somewhat lacking. Far from being ‘weird’, algal biofuels offer huge potential to solve much of our future transport-fuel requirements, freeing-up large sections of the middle-east from ‘democratization’ in the process. Recently, ExxonMobil has partnered with Craig Venter, sequencer of the human genome and creator of synthetic life, and invested $600 million in their own algal biofuel research program– they must have seen some potential in this ‘weird’ technology then. So why is this technology potentially so promising? What are the major challenges, and how might they be solved? Algae are responsible for almost all the oil reserves that we use today: over millions of years they took carbon dioxide (CO2 ) from the atmosphere, packaged it into organic molecules, and sunk to the ocean floor to start their long transition into crude oil. By growing, and then harvesting, lipids from algae we can produce a similarly useful transport fuel (biodiesel), via a process called transesterification, without waiting millions of years for the end product. Technologically this is pretty simple, and the resultant fuel can be used in most existing vehicles, without the need for modification – a few months ago a commercial US flight flew on a blend of traditional and algal biofuels. 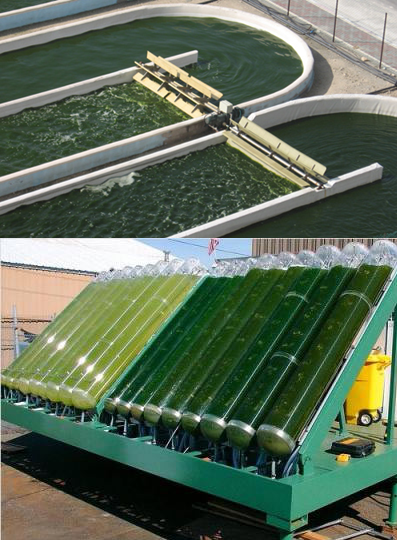 Although algae (including seaweeds) may also be used directly as a solid biofuel to generate heat, steam and electricity; converted to gaseous biofuels, such as biogas and biohydrogen; or (the starches) fermented to liquid biofuels such as bio-ethanol and biobutanol, this article will only deal with biodiesels created from algal lipids – it is these biofuels that are perhaps the most exciting as they are the most similar to petroleum, allowing them to be easily incorporated into our current transport infrastructure. At this stage I should point out that although burning biofuels releases CO2 , this is CO2 that was ‘taken up’ in the growing process; we therefore consider these fuels to be, theoretically at least, carbon neutral. Traditional biofuels made from crops grown on land are pretty awful from a sustainability point of view: they use valuable freshwater resources and arable land (40% of corn in the US is used for bio-diesel), pushing up food prices. In other areas of the world large areas of rainforests are cut down to grow palm oil; it is estimated that the net CO2 emissions resulting from this are actually greater than would have been emitted if the forests had been left alone. This is partly why algal biofuels, grown in open or closed bioreactors, are so attractive: algae can potentially be grown anywhere with large amounts of sun (such as uninhabited deserts) using seawater (which is not in short supply). Another advantage is that the photosynthetic efficiencies, and therefore growth rates, of algae are much higher than terrestrial crops; combine this with the fact that some algal species can accumulate very large amounts of fatty molecules (the useful bit for biofuels) and it means that much less land area (over 30 times less!) is required to achieve the same yield. However, as extracting crude oil from the ground is still, believe it or not, a relatively cheap process, the cost of algal biofuel production needs to fall (or the price of oil needs to rise) by at least five times in order to make it competitive with petroleum. There are three identifiable stages in production where improvements in efficiencies can be made: growth, harvesting and extraction, and processing. The first step to improving growth efficiencies, subject to much research at the moment, is to identify (or genetically modify/engineer) a target algal species/strain from the estimated 300,000 species that are out there. Ideally, this species would be ‘a fast-growing fatty’ – it would have a high growth rate, with a high lipid (fat) yield. This is where one of the biggest challenges lies, as fast growing algal cells tend to produce lower lipid yields: only when there is insufficient nutrients for growth is excess carbon from photosynthesis channeled into fatty storage molecules. The best way that has been found to deal with this is to first grow cells under excess nutrients, in order to increase biomass, followed by nutrient deprivation – leading to increased cellular ‘fat’ content. Another way to increase growth rates of algae would be to tackle some of the inherent inefficiencies of photosynthesis, which is only (at most) 8-10 % efficient – for comparison, synthetic solar-panels have reported efficiencies of about 30 %. I won’t go into much detail here as this gets quite complicated (see this paper if you’re interested) but basically, part of that inefficiency is related to the fact that only a small amount of available light is used/captured, part of this inefficiency results from energy that is used in cellular respiration, and part of that inefficiency is related to inherently wasteful parts of the photosynthetic process (e.g. photorespiration). If efficiencies cannot be raised to somewhere near that of synthetic solar panels, however, it would arguably be more pragmatic to use electric vehicles run from electricity produced from solar power stations, reserving the use of algal biofuels for transport where electric motors would not be a viable option – such as in aviation and long-haul shipping. Once algae have grown, cells need to be harvested and their lipids extracted. These two processes potentially require a large amount of energy. Ideally, algae would be modified so that they would secrete lipids from the cell, allowing them be ‘skimmed off’ without the need to harvest the cells. 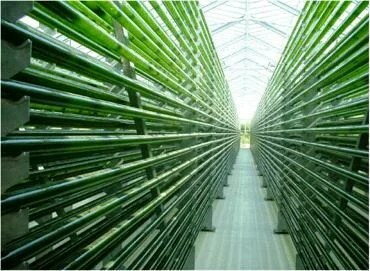 This would be a fantastic solution as it would simultaneously allow for high algal numbers to be continuously maintained, and would remove the costly steps of extracting lipids from within cells and disposing of the cell remnants that cannot be (directly) used for biofuel production. In the current absence of this technological breakthrough, perhaps the next best option is to ‘magnetically harvest’ genetically modified algae, extract high value pharmaceutical products, and ferment the cellulastic material to produce methane and fertilisers. Algal biofuels may still need a lot more tweaking before they become economically viable, but I hope this post shows that far from being ‘weird’, they in fact offer – possibly in combination with other technologies – a very viable (sustainable) replacement for fossil fuels. What they need is public and political support (perhaps tricky when fossil fuel lobbyists hold so much power over our political system), and possibly even initial subsidisation from governments to make them competitive with fossil fuels in the early stages – if you think this sounds extreme, consider how much ‘unseen’ subsidisation the fossil fuel industry receives. Barack Obama should be praised for his support of this technology. Let’s hope that those who have mocked him will look more than a little foolish in the not so distant future as they drive around in their ‘pond-scum’ fueled cars. Mobashera, M.A., and Dabbagha, F., 2012. Microalgae Biofuel Potentials (Review). Applied Biochemistry and Microbiology. 48: 126-144. Pienkos P. T., Darzins A., 2009. The promise and challenges of microalgal-derived biofuels. Biofuels Bioprod. Bioref. 3: 431–440. Scott, S., Davey, M., Dennis, J., Horst, I., Howe, C., Lea-Smith, D., Smith, A., 2010. I have got 1 idea for your weblog. It appears like at this time there are a couple of cascading stylesheet problems while launching a selection of web pages within google chrome and opera. It is operating okay in internet explorer. Probably you can double check this.